As the toothpaste tubes of most non league and league divisions have been discarded, it was time to cut in half and scrape the residue out of the protracted Cheshire League Premier season, to find one of four games left; at Styal FC. Visitors Eagle Sports, from Warrington, had no choice but to finish their season in Styal. 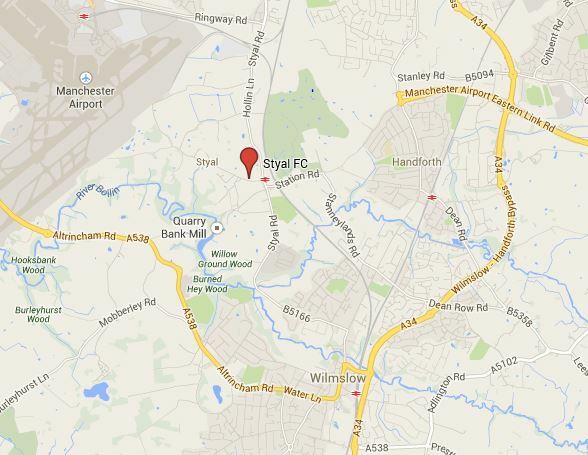 Styal, on the other hand, were likely to be picked apart like prey, sport for eagles. They had had a disappointing season, finishing near the bottom; but avoiding relegation. Eagle were vying for runners-up spot, with Rudheath Social. They needed to win and preferably by a few goals to overcome Rudheath’s one-better goal difference. This would put them three points ahead of Rudheath prior to Rudheath’s last game, away to Gamesley. The odds were on a comfortable away win. 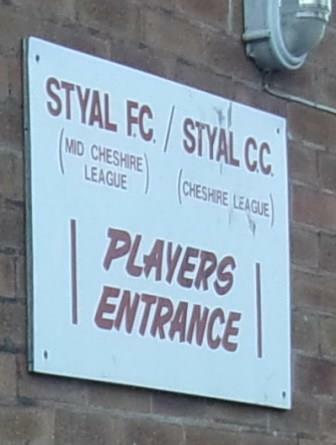 These odds proved, however, to be well wide of the mark; with Styal winning on points in a goalless draw, the first in the league this calendar year. The 0-0 whisperer strikes again! Styal belied their lowly position with some fluid passing movements and well-timed defensive tackles, but their attacks were stilted. A failure to shoot and get in scoring positions was painful to watch at times. Often nobody was in the box to receive crosses, often a shot in clear sight of goal was eschewed for yet another pass… and then another; until they lost possession. A little guile and confidence, providing a laxative for their constipated attack, would make them dangerous. I think Eagle Sports’ defence also contributed to their lack of clear cut chances, proving belligerently well organised. But because of this failing in the final third, it was Eagle Sports who came closest to scoring. They hit the post twice – once after the Styal keeper spilled the ball to an onrushing attacker; and despite the gaping maw of the goal, the ball was struck against the upright. The second was a huge cross that almost went straight in, hitting the top corner of the post and bar. Almost the sort of goal that seemed to regularly appear in Archie MacPherson’s Scottish round-up on Football Focus, in the eighties. Considering their runners-up pretensions, I was a bit disappointed by them this evening, although their defence held together well. Score-line aside, it was a perfect evening for football in the Cheshire villlage of Styal. The sun was out and it was even warmish. Such a shame that just when the weather improves and the nights become lighter, the season ends. Next door to the cricket field was a country pub, called the The Ship, which sold a variety of guest ales. I plumped for Weetwood’s Cheshire Cat and Dunham Massey’s Big Tree Bitter. I supped in the garden, out front, listening to the mixed sounds of the country, traffic and chatter, attaining a pleasant beer buzz, before wandering the fifty yards down the country lane, Altrincham Road, after which the ground is named. 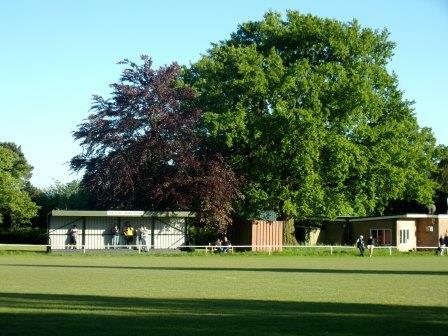 The most distinctive thing about the ground is the lush rural setting and some fabulous trees. The small, easily missed, entrance is through a gap in the hedgerow. The thin car park sits behind a clubhouse shared with the adjoining cricket club (which, by the way, sells Wincle Brewery’s Rambler on draught). In front of the clubhouse is a distinctive oak tree, kind of marking a boundary between the two sports. Another, and mightier, oak resides at the bottom. These are joined round the ground with a copper beech, poplars and a number of others. Beyond the trees to one side sheep graze and occasionally baaa (translations of which were mostly oh ffs shoot will you!) , to provide an extremely rural and peaceful backdrop. Providing a foil to the pastoral surroundings was the intermittent roar of jet engines from planes taking off from nearby Manchester Airport. It was a strangely comforting sound to accompany the birdsong from the trees, the shouts among players and boots on leather. The ground has a stand, which I wasn’t expecting. It even has a name, the Alan Jones Stand. It was a drag and drop bus shelter variety but a welcome addition. Two dugouts opposite, the obligatory roller and scaffolding poles providing the perimeter bar complete the scene at Altrincham Road. Football in Styal goes back just over 100 years to 1912. The early years were spent playing in the Lancs and Cheshire League. In 1958 they joined forces with the Cricket Club to build a pavilion and pitches on the Altrincham Road site. 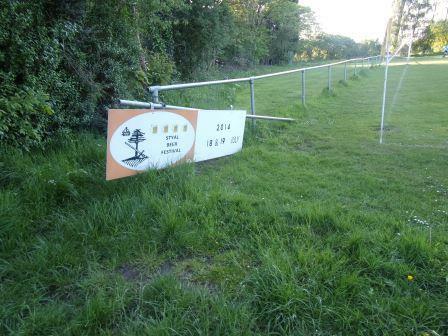 They joined the mid-Cheshire league in 1982 and made £20k of improvements to their heavy pitch in 2000. Work is still needed as evidenced by the pools and spongy ground behind the goal, caused by recent heavy downpours. 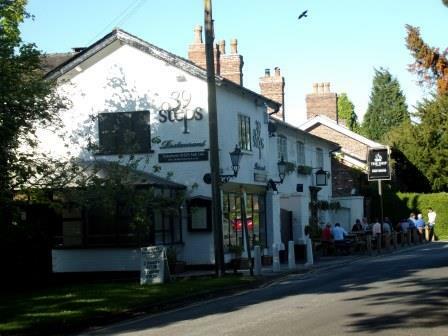 The village of Styal grew up for the workers of the National Trust owned Quarry Bank Mill and it’s country park (worth a visit) and also has a women’s prison, HMP Styal. It’s most famous citizen is Terry Waite. When you’re knocked on your back and your season’s a flop, when you’re down near the bottom there’s nothing else… but to shout to the top, shout. I asked him what he thought about their prospects next season. He replied: You see things can change, Yes an’ walls can come tumbling down. Generally he seemed like a changing man. After this encouraging performance hopefully next season Styal will be a changing club, in the right direction. It’s a great venue for for a bit of footie on a summer evening. This entry was posted in Groundhopping, Non-League, Travelog and tagged altrincham road, Cheshire League, Eagle Sports, mid cheshire league, Non-League, styal, styal fc. Bookmark the permalink. 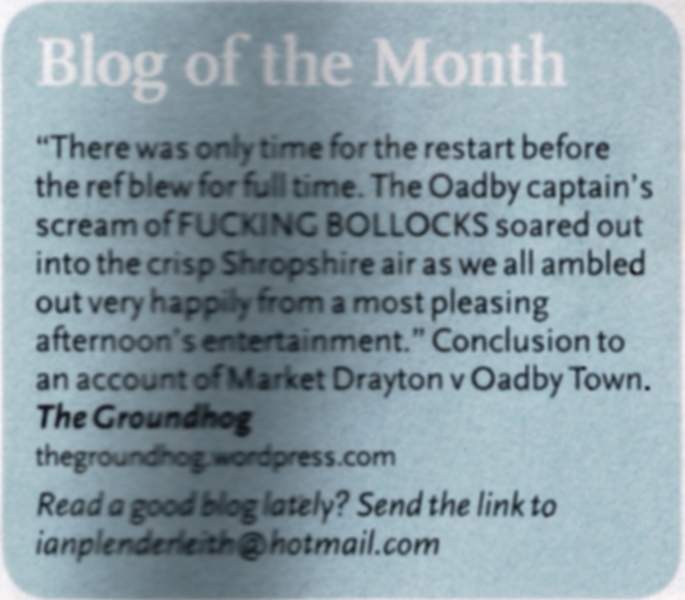 Love the line about “finishing their season in Styal”! I appreciate your comments. Every time I think ‘I’m gonna stop doing this’ you make a perfectly timed complimentary comment – cheers! I can’t believe you didn’t mention the amazing beer festival that Styal FC run in the summer, with all of the local real ales! Neither can I. Sorry! Big oversight from a real ale lover. I’ll amend the article to include it.